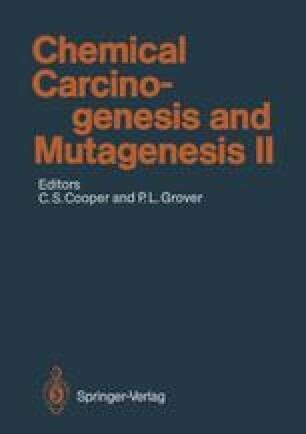 The importance of in vitro assays of mutation in mammalian cells in the detection and study of carcinogens follows from a consideration of the role of mutation in carcinogenesis. An involvement of mutagenesis is implied from studies of the modulation of oncogenes where G → T transversion in codon 12 of H-ras was seen in the activation of a human oncogene in bladder tumour carcinoma cells (Reddy et al. 1982). Point mutations at other positions within ras genes have also been detected. For example, point mutations at codon 13 have been observed in DNA from patients with acute myeloid leukaemia (Bos et al. 1985). A direct involvement of mutation is seen in studies in which mutations have been analysed in tumours from rodents treated with classical carcinogens. Here codon 12 of the H-ras gene was shown to be altered in mammary tumours induced by nitroso-methylurea in rats (Sukumar et al. 1983). In mouse liver, spontaneous tumours or tumours induced by treatment with furan and furfuranal were analysed (Reynolds et al. 1987). In the spontaneous tumours the activated H-ras mutations were always at codon 61. However, 40%–60% of the ras oncogenes detected in the furan- or furfural-induced tumours were at sites other than codon 61, suggesting that these novel mutations are a reflection of mutagen specificity. Two activated raf genes and four undefined oncogenes were detected in this study.